When I press play within 3 seconds a prompt pops up saying Tomb Raider has stopped working as you can see in the screenshot above. I can't get into the game what so ever. I can't even get to the games launcher window. Tried running the TombRaider.exe from the folder as admin. Tried verifying the integrity of game cache. Tried deleting the Tomb Raider registry. Tried to disable Tessellation by changing the registry. Tried to disable ExclusiveFullscreen by changing the registry. 09:50:56:726 (2768) > NVAPI loaded succesfully. 09:50:56:831 (2768) > D3D reports feature level 11 is supported. 09:50:56:870 (2768) > NVAPI Depth Bounds Test supported. 09:50:57:326 (2768) > NVAPI loaded succesfully. 09:50:57:446 (2768) > D3D reports hardware supports RGBA16UNORM blending. Not sure what else to try, anyone have an idea of what I can do? what at times help is deleting the registryblob in the steam folder. no guarantee but worth a try. i had it to with some games and this mostly resolved my problem. also deleting the game can help. Thanks for the response, but still no luck. damn. did it just happen today or for the last few days? at times, the next day it will work. but again, no guarantee on that. sorry i cant help you with your problem. It's been doing it since launch. No problem, Thanks for trying! I have had the very same problem, INSANE loads of times, suddenly just stops working, it was intence in the start but further out it the game less of it but still some. 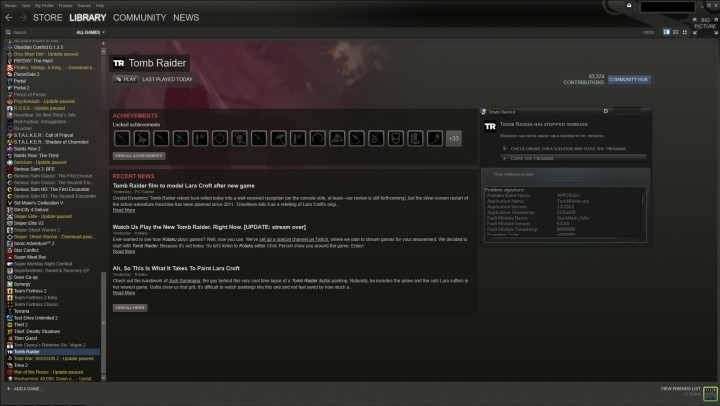 I just finished downloading the game tonight on Steam and I got a "Tomb Raider has stopped working" after about 20 minute of play. I take it is a driver related issue. Any solutions or known driver version that works? All other games are proper. I'm going to downgrade drivers and see if that helps in the meantime. Really sorry you're having issues - I know you want to get back playing. Unfortunately I'm not a PC buff personally, but our support staff has been troubleshooting similar issues since launch. Any chance you could create a ticket below? I had similar issue, I contacted Square Enix Support Centre, I got a answer, I did what they recomended me and the issue is gone. In case it maight help anybody, I copy and paste the answer I got from them. 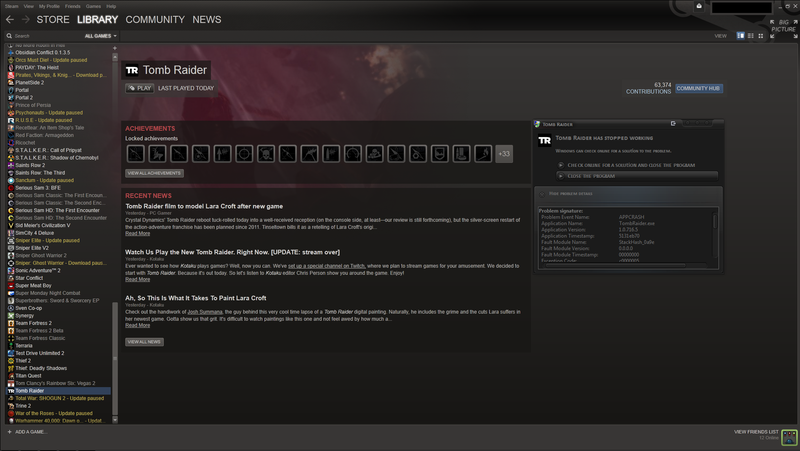 We are very sorry to hear that you are having issues with Tomb Raider. 4) Click OK. This will load the System Configuration Utility. 5) On the General tab, click Selective Startup, and then click to clear the check box "Load Startup Items". This will stop most of the extra software loading when windows boots, this is simply to check if it is another program on your PC that is causing this. In order to restore your PC to a normal boot follow the steps above again and on the General tab choose Normal Startup, Apply and ok. If this does not resolve the issue, please do not hesitate to contact us again.